Good day to you, my young sisters. It occurs to me today to share this thought with you, and hopefully encourage you to redeem, rescue or protect your discovery decade. I am less cynical about lending money — not because I have only good experiences to report, but because the nature of all people is not to steal from us nor take advantage of our kindness. I think we need TONS OF WISDOM before we commit, and if disciples of Jesus Christ, we need to know God’s mind on the matter as well. First, I want you to know that YOU HAVE A CHOICE about what you do with your money. Spend time and unify your heart and mind and mouth on your PERSONAL FINANCE POLICY. That is, know the following about yourself. Second, I want you to know that YOU MUST LIVE WITH YOUR FINANCIAL DECISIONS. My positive experiences far outweigh my negative experiences with lending money, but that is not the case for everyone. Do not take this action lightly. Loaning $40 for gas money or $100 for a bill is different from co-signing on a loan. BEWARE. The saying is true that money magnifies who we really are… and if a person’s track record speaks, then don’t turn down the volume! Third, if you lend BE CLEAR ABOUT THE REPAYMENT TERMS. Make sure the borrower understands this is a loan and you need the money back…AND WHEN. Then give them room to make their word good. We know when we owe a debt. We do not forget that kind of thing… unless we have a cavalier attitude toward money. So make sure you LEND LOUDLY; in other words, speak up and be clear about the expectations. Fourth, DO NOT BE AN ARROGANT LENDER. Do not seek to trap friends and family with this one good deed. Remember, acts of mercy are reciprocal. We may not reap it, but our children will. Our turn to need mercy is inevitable. Let’s hold borrowers accountable if necessary, but sincere borrowers won’t let time pass and not communicate their repayment status. Wisdom is necessary here because a reward for obedience to God is to lend and not borrow (See Deuteronomy 28:12). Abundant life is our portion (John 10:10); to owe nothing but God’s love to others (See Romans 13:8). We must develop the mind to appropriate riches and resources wisely…and learn that truly it is better to give than receive. Many of us have giving hearts without the accompanying resources, and we lock ourselves into need because we give when we do not have. So if giving is one of our governing values (a principle that guides our lives), we need to prepare to give well. 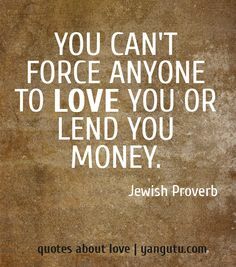 It is your choice whether or not to borrow money. From an experiential perspective, it is good for a person to get to this point at least once (or witness someone close to him in this process) because it teaches compassion for another’s struggle. Not everyone hits a financial need because they manage money poorly or overspend or live beyond their means. Sometimes, the Lord tests our hearts. Other times, people do not keep their promises. Then at other times, some needs exist because of emergencies or unplanned things. If we ever have to borrow, then we can empathize with those sincere ones who need us to lend. Finally, I want to speak to the “twinges” of fear or hesitation about lending to others. Relationships do not have to die because of money. Sometimes when we give, we take a loss… BUT WE NEVER STOP GIVING. We watch our personal policy and extend more care the next time. We must know the difference between temporary help and enabling. Sometimes, our cash withdrawal does more harm than good and tough love (along with letting this friend or family member bring themselves back up) may be the solution. The reality about relationships is that all of them are not for all time. DO NOT LET LOYALTY BE YOUR GUIDE. We must think enough of our names to make and keep them good in the earth (See Proverbs 22:1). We must care enough about our names and not forfeit their value to others. Do not lend and borrow just because you’ve been friends for years (because then you know your friend’s unreliability with money). Take ownership for your good name. In your 20s you may buy your first car or home. If this is the case, then you may upgrade in your 30s. Your name and standing (attached debt) are a GIGANTIC FACTOR in your approval for these big items. And you don’t want to experience delay because you lent to the wrong people. Just a thought today for you. I love you all to life!